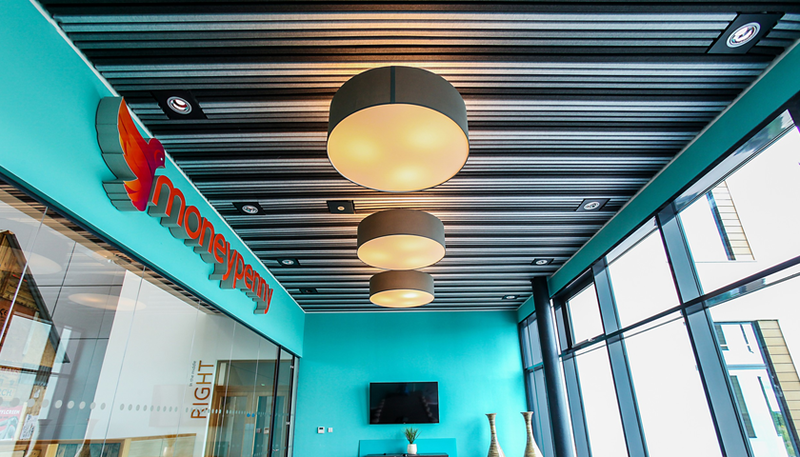 Born in 2000, Moneypenny are a telephone answering service and outsourced switchboard company who have recently acquired Europe’s first Felt Ceiling system. They look after more calls for more businesses than any other company. To reflect the companies drive for innovation a new £15 million headquarters has been built. AEW Architects, Manchester, were commissioned to design the Moneypenny offices, near Wrexham, Wales. The brief was to create an inspiring working environment for the employees. The new building includes many novel features including a pub and nature trails, but one of the main features of the three-storey building is a 17-metre high central atrium, which houses a treehouse meeting room, stadium seating and an indoor terrace. A ceiling was required for a canopy within this space and ceiling experts Hunter Douglas were originally specified to deliver a linear metal system. However Hunter Douglas’s innovative, new ceiling choice: the HeartFelt Ceiling System was shown to the architect. The HeartFelt ceiling system is made from 100% recyclable material, including the carrier system. The very nature of felt means that the system provides supreme acoustic control. The architect was keen to use it for the ceiling of the canopy – and selected three soft complementary tones to give a depth and added warmth. “The architect was keen to use this new felt ceiling because it added further ambience to what was already going to be an interesting building. It is exciting to be able to showcase a new ceiling system for the first time and we are really pleased to see how it looks now it is in place,” said Rob. HeartFelt, which complies with regulations for use in non-polluting buildings, is resistant to dirt and dust, meets the indoor European standard EN 15251, and EN 13501 Class B, S1, d0 fire certification. For more information about Hunter Douglas and their innovative felt ceiling systems please visit the Hunter Douglas website.